Enlarge / At 8:15am ET on Thursday morning, a less organized Florence approaches the North Carolina coast. Ten years ago today, Hurricane Ike made landfall as “only” a Category 2 hurricane along Galveston Island near Houston. Though Ike had 110mph winds at landfall, it had grown very large over the Gulf of Mexico, and this large size allowed it to develop an enormous amount of “integrated energy” that manifested itself as a devastating storm surge. With about $30 billion in damages, Hurricane Ike was, at the time, the second-costliest U.S. hurricane on record. As of Thursday morning, Hurricane Florence has weakened to 110 mph as it contends with slightly increased wind shear and drier air. Technically this means Florence is no longer a “major” hurricane, and may not be when it reaches the North Carolina coast early on Friday morning. Practically, however, that won’t matter when it comes to storm surge and inland rainfall. The simplest, most common metric for the measurement of a storm’s intensity is maximum wind speed, and certainly this matters in terms of pure destructive potential when it comes to, say, losing a roof or propelling debris through the air. But when it comes to water, the maximum wind speed matters less than the size of the wind field for both storm surge and the destructive power of waves moving onshore. And Florence is a large storm, with hurricane-force winds extending outward up to 80 miles from the center and tropical-storm-force winds outward up to 195 miles. The primary example of this is 2012’s Hurricane Sandy, which had modest 80mph winds by the time it reached the New York and New Jersey areas. But because the storm was so large it produced a destructive storm surge in New York City, and caused an estimated $65 billion in damage in the United States. (At the time it became the second costliest US hurricane, but has since been supplanted by Harvey and Maria, both in 2017). The area to the north of Florence’s landfall along the North Carolina coast—storm surge is always worst to the “right” of a storm’s center, where its rotation pushes water onshore—is less populated and developed than the New Jersey and New York shores. But the storm surge will be no less devastating for homes and business located there. Areas from Cape Fear to Cape Lookout face a potential 9 to 13 feet of storm surge, the National Hurricane Center warns, on top of the normal tides. Florence’s slow movement over the next two or three days will add another element of uncertainty. 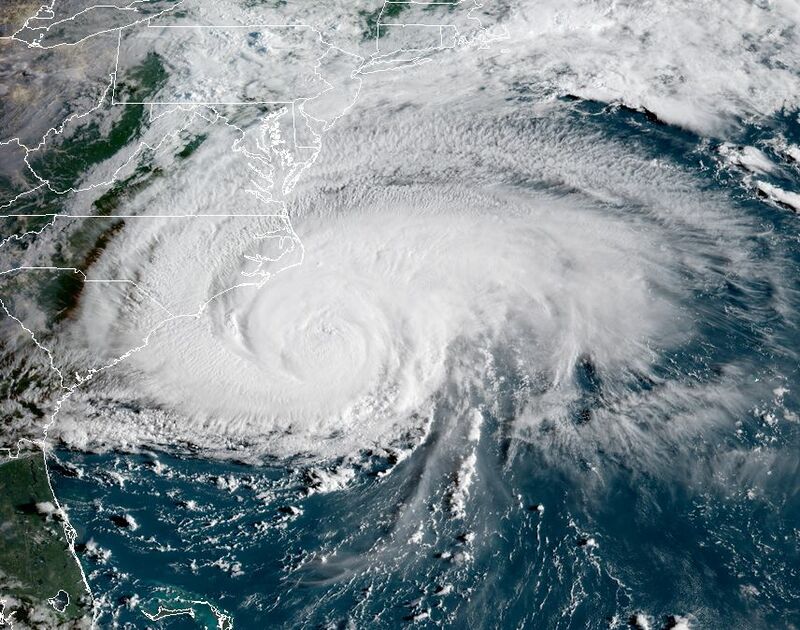 Meteorologist Greg Diamond has noted that areas along the coast of North Carolina on the right side of the storm could experience a significant storm surge through multiple high tide cycles, which would have a cumulative battering effect. Florence’s size, and especially its slow-motion, will also contribute to significant rainfall. 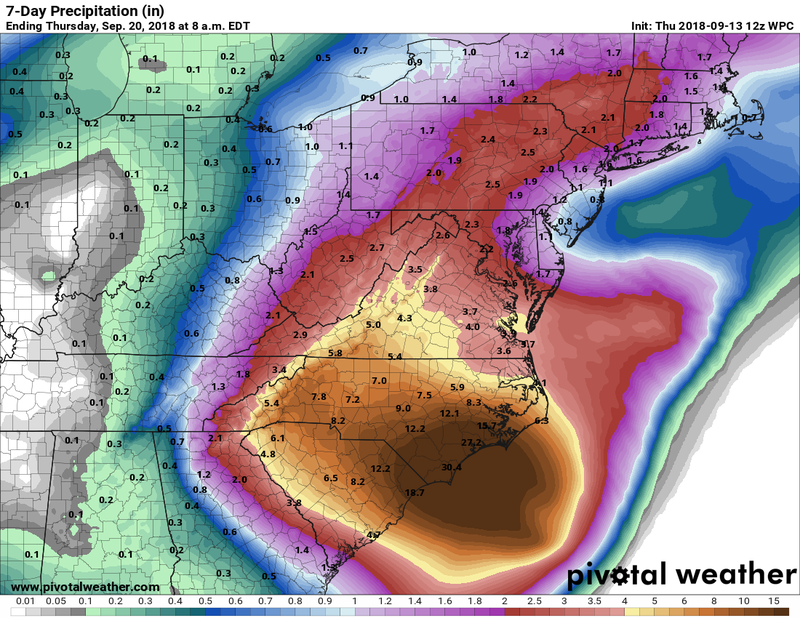 The heaviest rainfall is still expected in South and North Carolina, with upwards of 30 inches of rainfall possible in some locations. Enlarge / NOAA rainfall forecast for the next week through Wednesday. It is important to recognize that while attention will be focused on coastal impacts from Florence, inland flooding will remain a problem for some areas well into next week.